Picture: The women waiting at the tomb, Station 14, Stations of the Cross, Church of the Nativity, Rancho Santa Fe, California. Stations by Max DeMoss. Photo by me. "Our God is not a remote god, untouchable in His beatitude; our God has a heart. He has a heart of flesh. He took on flesh precisely to be able to suffer with us and be with us in our sufferings. He became man to give us a heart of flesh and to awaken in us love for those who suffer and are needy." The Vatican's page on Holy Week 2007 includes links to the Presentation and Meditations from last night's Via Crucis, in various languages. In the future, pictures of the celebration will be added. That address now appears on that page only in Italian, and other languages probably will be added later. The translation above is from Teresa Benedetta. A translation is also available from Zenit. Father Raniero Cantalamessa, OFM Cap, delivered the homily at the conclusion of the Gospel reading during yesterday's Liturgy of Our Lord's Passion at St. Peter's Basilica. Pope Benedict XVI presided. An article is available from Catholic News Agency. Translations are available from Zenit, from Teresa Benedetta on Papa Ratzinger Forum, and from Denis Barrett on Father Cantalamessa's Website. Father Cantalamessa spoke about the women at the cross, describing them as "Mothers of Courage." He said that all of the people who wanted Jesus dead were men, and no women are described among them in the Gospels. Even Pilate's wife distanced herself from the sentence. They were the first to see the resurrected Jesus, he said, because they were the ones who never left him, and even when he was dead, they came to bring spices to the tomb. 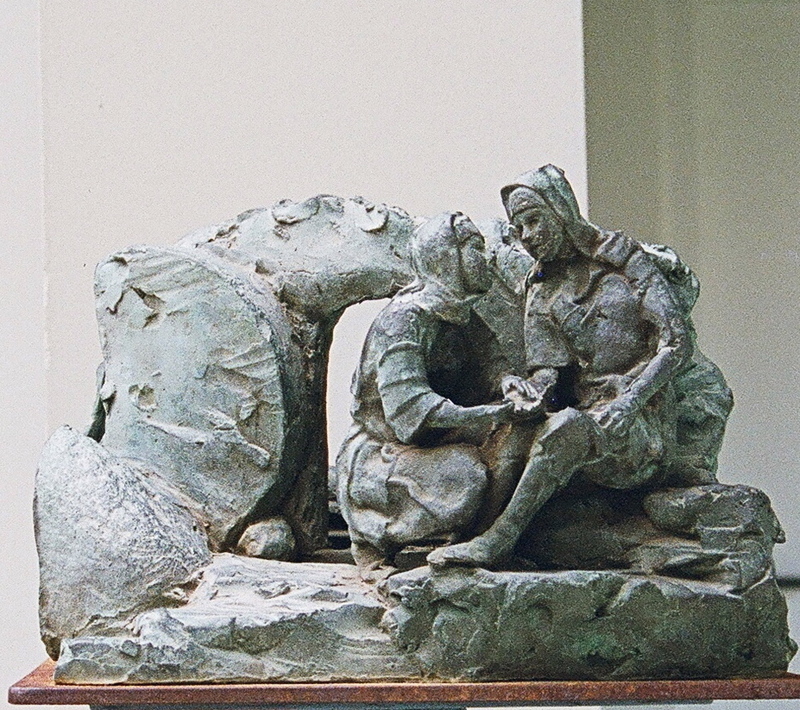 Jesus explained their motivation in describing the woman who bathed and kissed his feet in Luke 7:47: "She has shown great love." "On all sides the need is arising for us to give more scope to women. We don’t believe that “the eternal feminine will save us”[W. Goethe, Faust, finale of part II: “Das ewig-Weibliche zieht uns hinan"]. Everyday experience shows that woman can 'lift us to the heights', but can also plunge us into the depths. Woman too needs to be saved by Christ. 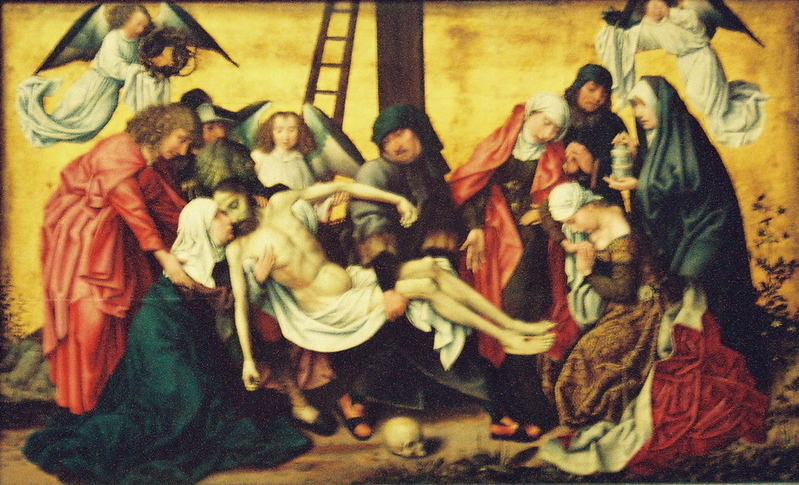 But it is clear that once she has been 'set free', on the human level, of all the old subjections, she will be able to do much to save our society from certain inveterate evils that threaten us: violence, the will to power, spiritual aridity, the lack of regard for life. . . ."
- Picture: "The Deposition" by a follower of Roger van der Weyden, Netherlandish, about 1490, photo by me. Museum information. 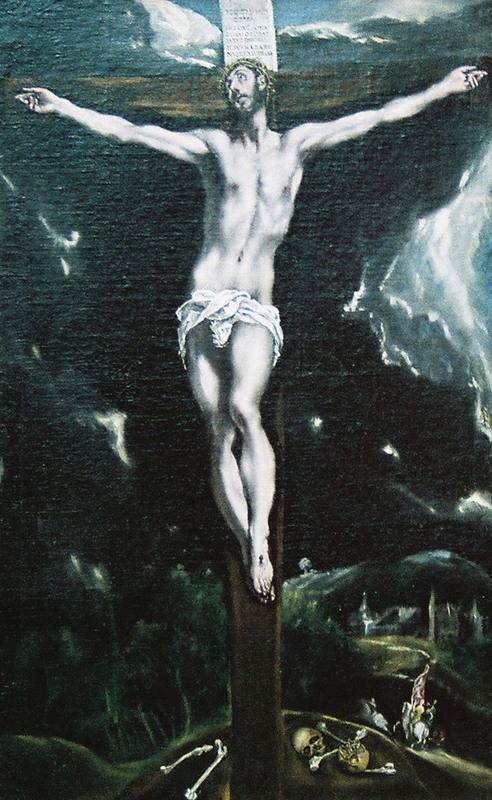 Picture: "Christ on the Cross" by El Greco, Greek/Toledo, Spain, 1600-1610, photo by me. Museum information. To open that kingdom to them He wills to die on the cross. - St. Thérèse of Lisieux, The Story of a Soul, ICS Publications, Manuscript C, Chapter 10. 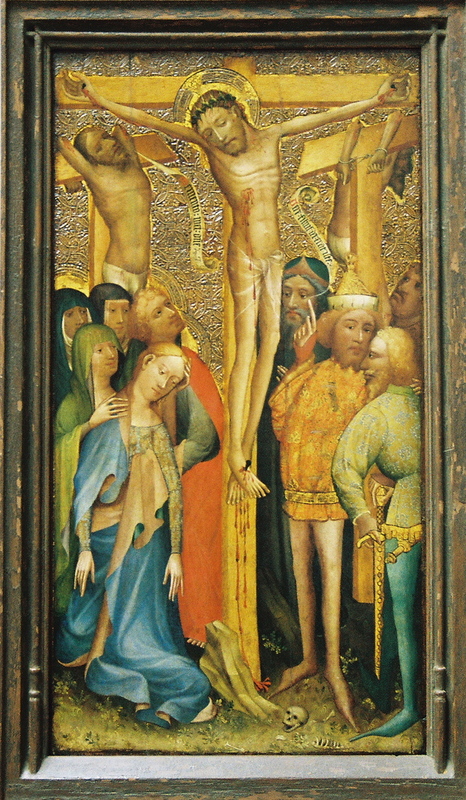 Picture: "The Crucifixion" by a Westphalian master, England, abour 1490-1500, photo by me, taken at the Getty (lent by the Berger Collection). I could not find it presently on the Getty website. More information here. The Easter Triduum begins today with the Chrism Mass in each cathedral. Asia News has an article about the Mass at the Vatican, with the Pope's Chrism Mass homily, blessing of the oils, and priests' renewal of their ordination vows. He spoke about the theology of baptism and the role of a priest. Full translations of that homily are available from the Vatican and from Teresa Benedetta at Papa Ratzinger Forum. "This theology of Baptism returns in a new way and with new insistence in priestly ordination. As in Baptism, there is an 'exchange of garments', a change of life, a new existential communion with Christ. In the priesthood, one undergoes a change: in administering the sacraments, the priest acts and speaks in persona Christi. "In the sacred mysteries, the priest does not represent himself, he does not speak to express himself, he speaks for the Other - for Christ. So the Sacraments make dramatically visible what being a priest means, in general: what we expressed by our "Adsum" - I am here, I am ready - during our priestly consecration: I am here so you may dispose of me. "We make ourselves available to Him who "died for everyone, so that those who live no longer live for themselves" (2 Cor 5,15). To put ourselves at the disposition of Christ means we allow ourselves to be drawn into His 'for everyone' - being with Him, we can truly be 'for everyone'." "I saw how different was my piercing." "After Communion, I saw our Lord most distinctly close beside me; and He began to comfort me with great sweetness, and said to me, among other things: 'Thou beholdest Me present, My daughter,—it is I. Show me thy hands.' And to me He seemed to take them and to put them to His side, and said: 'Behold My wounds; thou art not without Me. Finish the short course of thy life.' By some things He said to me, I understood that, after His Ascension, He never came down to the earth except in the most Holy Sacrament to communicate Himself to any one. He said to me, that when He rose again He showed Himself to our Lady, because she was in great trouble; for sorrow had so pierced her soul that she did not even recover herself at once in order to have the fruition of that joy. By this I saw how different was my piercing. But what must that of the Virgin have been? He remained long with her then because it was necessary to console her." - St. Teresa of Avila, On the graces received at Salamanca at the end of Lent, 1571, from Relation IV. 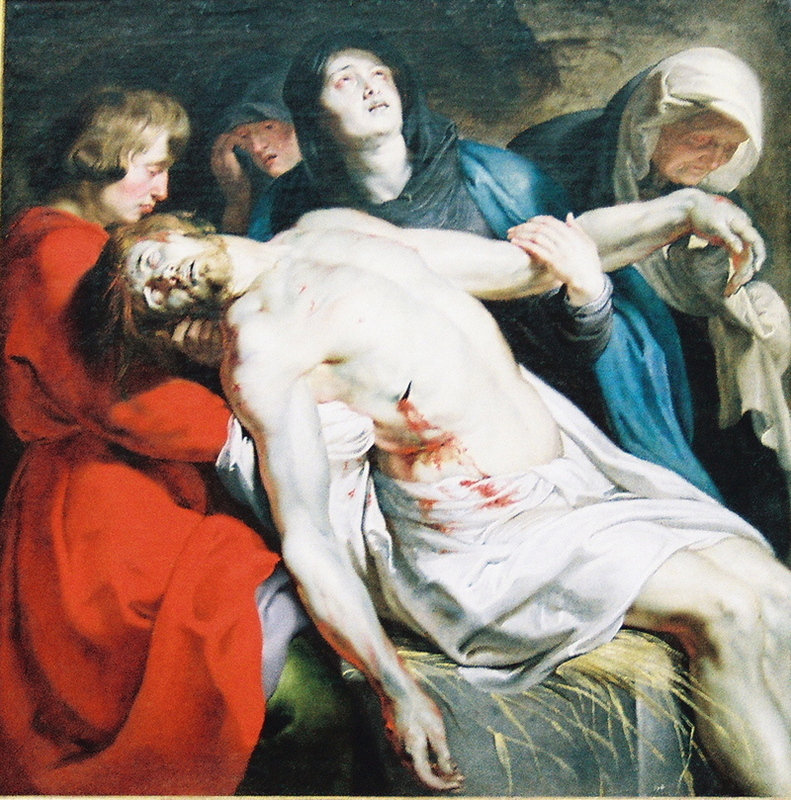 Picture: "The Entombment" by Rubens, Flemish, about 1612, photo by me. Museum information. In today's General Audience, Pope Benedict XVI spoke about the meaning of the various services of Holy Week, from today's observance of Spy Wednesday through Saturday evening's Easter Vigil. An article with quotations is available from Asia News. Full translations are available from the Vatican, Zenit and from Teresa Benedetta at Papa Ratzinger Forum (scroll down). "In the coming days, we will commemorate the supreme battle between Light and Darkness, between Life and Death. "We also have to place ourselves within this context -- aware of our own "night," of our sins and responsibilities -- if we want to spiritually benefit again from the paschal mystery, if we want to bring light to our hearts, by way of this mystery, which is the center point of our faith. . . .
"These liturgical celebrations are not mere commemorations of past events; they introduce us to the ever-present reality of God's saving power. Today too, Christ's love triumphs over evil, sin and death. Truly, as Saint Paul says, 'if we have died with Christ, we believe that we shall also live with him" (Rom 6:8).'"